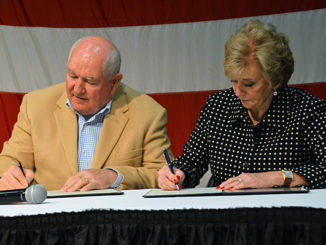 USDA administers several conservation programs with an emphasis on voluntary land retirement programs, working lands programs and conservation easements. Land retirement programs provide payments to agricultural landowners for temporary changes in land use or management with the goal of conserving soil, water and wildlife resources. Working lands programs allow private land to remain in production, while providing a cost-share and technical assistance to implement various conservation practices and address natural resource concerns specific to the area. While farmers and ranchers are already good stewards of water and land, the 2018 farm billexpands the public-private partnership to increase conservation initiatives with the goal of further improving water quality, wildlife habitats and populations, as well as protecting other natural resources. Today’s article reviews the major changes to the Conservation Reserve Program. A future article will review the changes made to the Environmental Quality Incentives Program and the Conservation Stewardship Program. CRP is the largest federally administered private-land retirement program, with annual outlays approaching $2 billion per fiscal year and an average payment of $77 per acre. 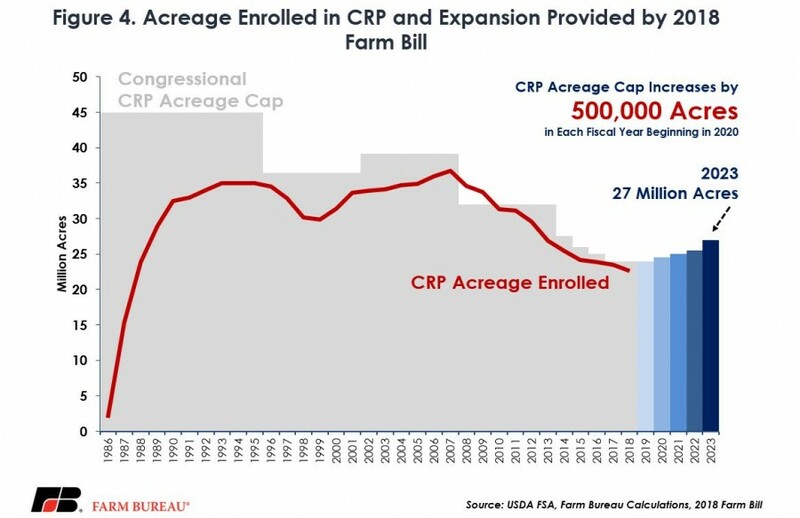 CRP enrollment is capped each year, and under the 2014 farm bill, enrollment was limited to no more than 24 million acres during fiscal years 2017 and 2018. For fiscal year 2017, the latest data available, Farm Service Agency data revealed 23.4 million acres were enrolled in CRP. Enrollment was the highest in Texas, at 2.9 million acres, followed by Kansas, at 2.1 million acres. 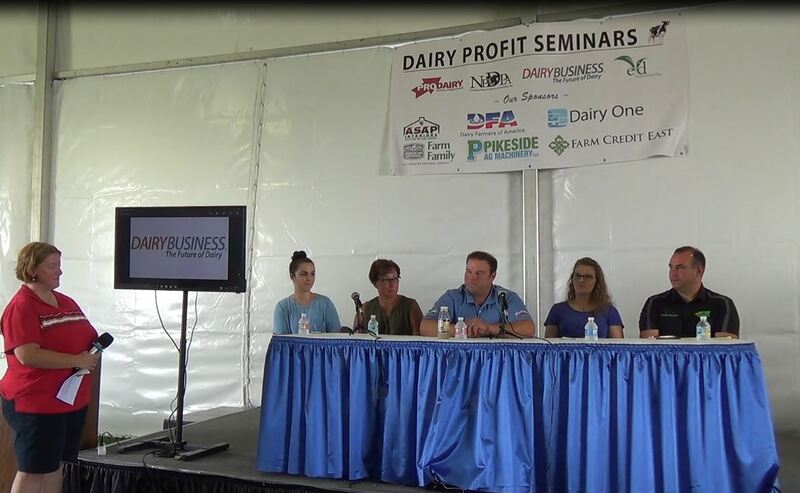 The top five states in terms of CRP enrollment were Texas, Kansas, Iowa, Colorado and North Dakota. Combined, these states have more than 10 million CRP acres and represent approximately 43 percent of all CRP ground, Figure 1. As of January 2017, there were more than 5.7 million acres enrolled in wildlife habitat CRP initiatives, representing 25 percent of all CRP acreage and making it the second largest practice installed on CRP acres, behind only grassland initiatives. CRP wildlife habitats were the highest in Kansas, at over 1.1 million acres, followed by Iowa, at 691,000 acres, North Dakota, at 650,000 acres, and South Dakota, at 399,000 acres. In these areas a number of counties have more than 25 percent of total CRP acres enrolled in wildlife preservation initiatives. Figures 2 and 3 highlight wildlife habitat acres installed on CRP acres as of January 2017 and the percent of total CRP acres dedicated to wildlife initiatives. The 2018 farm bill makes several modifications to the CRP program. First, the acreage cap under CRP is expanded to 27 million acres by 2023. However, acreage enrollment will be based upon historical state enrollment rates, and then 1 million to 2 million acres of CRP land must be dedicated grasslands that have a positive impact on water quality such as grass waterways, wetlands or wetland buffers. Figure 4 identifies historical and congressionally capped CRP acreage. 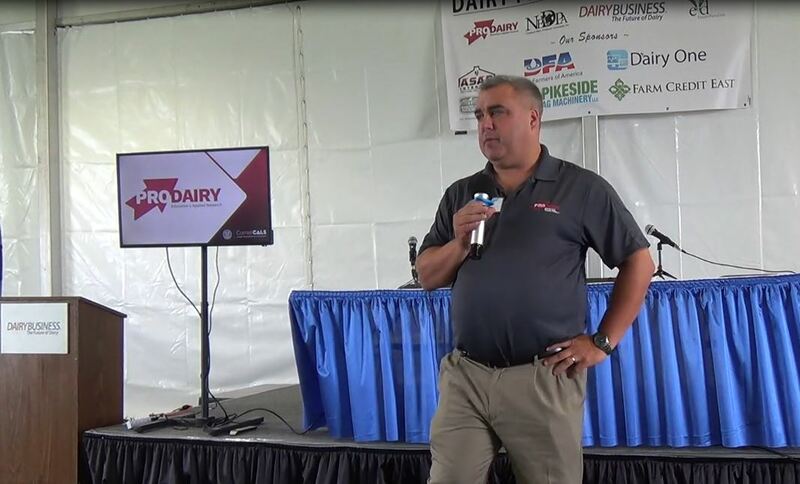 CRP was also modified to help farmers and ranchers during times of drought, flooding or wildfires by allowing emergency haying and grazing, as well as other forage uses, on CRP grounds–without a reduction in rental rates. This flexibility is greatly needed given recent droughts and natural disasters impacting agriculture. While there were several other improvements to CRP, including additional support for beginning farmers and veterans, one of the more significant modifications was a reduction in CRP rental rates. The 2018 farm bill reduces CRP rental rates to no more than 85 percent of the county rental rate for CRP general sign-up and no more than 90 percent of the county rental rate for CRP continuous sign-up. 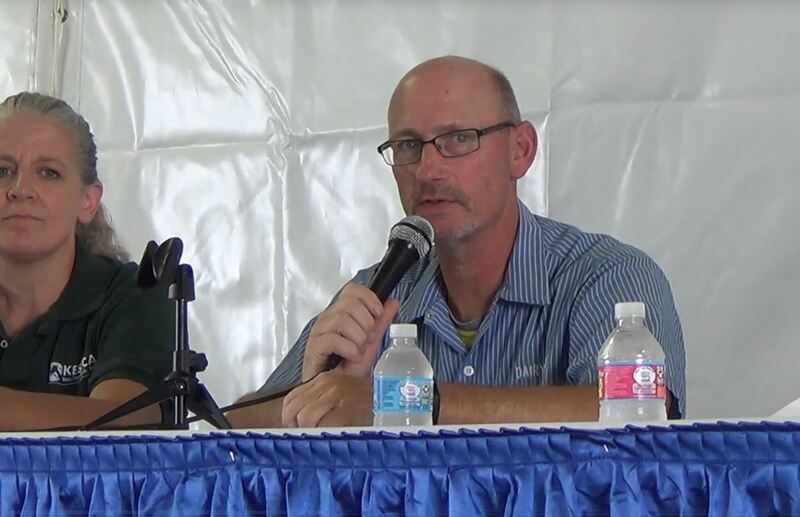 This is designed to better align CRP rental rates with market-based rates and should improve the availability of farmland for farmers and ranchers. U.S. average CRP rental rates have closely tracked agricultural land values, averaging $76 per acre in 2017 (Reviewing 2018 CRP Rental Rates). 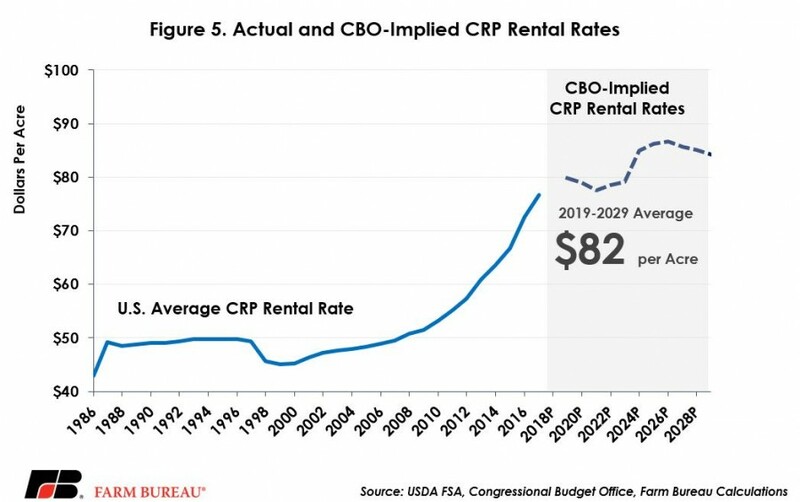 Based on the Congressional Budget Office’s projected outlays under CRP and the acreage cap authorized by Congress, CRP rental rates are expected to average $82 per acre over the next baseline period of 2019 to 2029, Figure 5. 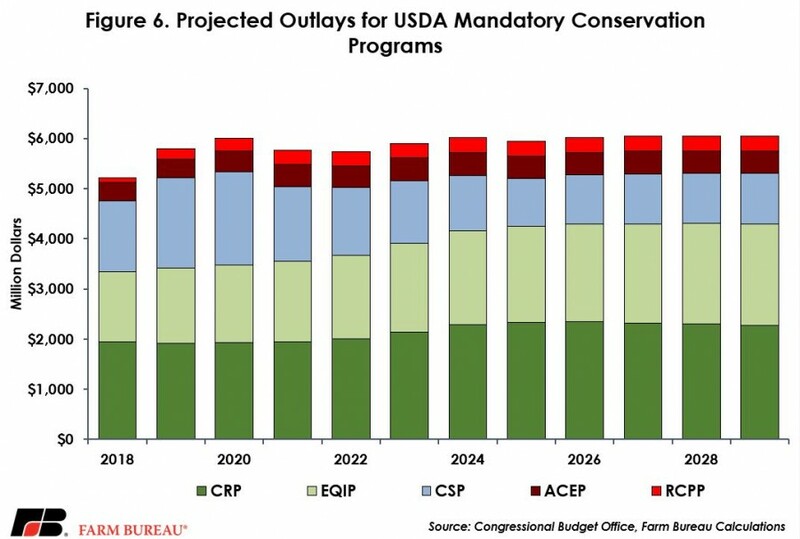 CBO recently scored budget authority and expenditures for USDA’s mandatory conservation programs, reflecting the changes made in the 2018 farm bill. From 2019 to 2029, conservation program outlays are projected at $66 billion. CRP outlays are projected at $23.7 billion and represent 36 percent of conservation program expenditures. Following CRP, EQIP outlays are projected at $19.9 billion, representing 30 percent of conservation payments. CSP outlays are projected at $13.8 billion and represent 21 percent of conservation payments. The remaining 14 percent of conservation payments total $8.6 billion and are represented by the Agricultural Conservation Easement Program, Regional Conservation Partnership Program and smaller conservation initiatives. Figure 6 highlights CBO’s projection for conservation program outlays for 2019 to 2029. CRP is a land retirement program that provides payments to agricultural landowners for temporary changes in land use or management with the goal of conserving soil, water and wildlife resources. Currently, fewer than 24 million acres are enrolled in CRP. The 2018 farm bill modifies CRP to improve resource and wildlife conservation practices by expanding the acreage cap to as many as 27 million acres by 2023. However, the bill also makes improvements in other areas of the program such as market-based rental rates and emergency haying and grazing during natural disasters. Combined, changes made in the CRP program will ensure that farmers and ranchers continue to be good stewards of wildlife habitats, land and water.